". . . an excellent textbook . . . well organized and neatly written." ". . . amazingly interesting . 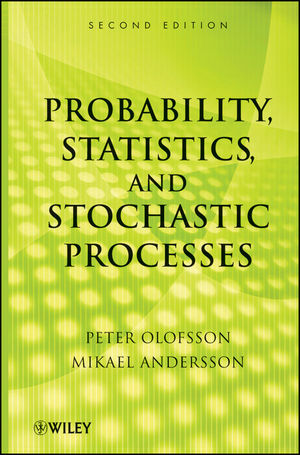 . ."
Thoroughly updated to showcase the interrelationships between probability, statistics, and stochastic processes, Probability, Statistics, and Stochastic Processes, Second Edition prepares readers to collect, analyze, and characterize data in their chosen fields. Extensively class-tested to ensure an accessible presentation, Probability, Statistics, and Stochastic Processes, Second Edition is an excellent book for courses on probability and statistics at the upper-undergraduate level. The book is also an ideal resource for scientists and engineers in the fields of statistics, mathematics, industrial management, and engineering. PETER OLOFSSON, PhD, is Professor in the Mathematics Department at Trinity University. Dr. Olofsson's research interests include stochastic processes, branching processes, mathematical biology, and Poisson approximation. He is the author of Probabilities: The Little Numbers That Rule Our Lives, also published by Wiley. MIKAEL ANDERSSON, PhD, is Associate Professor in the Department of Applied Statistics at the Swedish University of Agricultural Sciences. Dr. Andersson's research interests include stochastic modeling of infectious diseases, epidemiology, and biological applications.